Want to give a food gift that can be shared. The Golden Delights Tower is a mouthwatering treat that is a tower with a delicious combination of sweet & salty flavors. 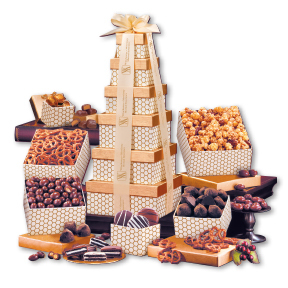 Featuring an assortment of traditional favorites: chocolate covered almonds, almond pecan caramel corn, cocoa dusted truffles, seasoned pretzels, chocolate covered Oreos® ; and two pieces of Godiva® chocolate. Your logo will be foil-stamped in gold on the ribbon of your choice: sheer burgundy or ivory satin. This will delight all those who receive it. Serves 8-12 people. Minimum is 8. A scrumptious selection that is sure to delight all who are lucky enough to receive it! Serves 8-12. 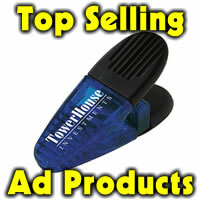 The tower is 6 ½” x 5 ¾” x 15 ¾” and the imprint is 3″ x 3/4″ repeated along the ribbon. 51.75 ea. Individual mailing cartons included at no additional charge.